We managed to get our hands on some Motorola LI4278 barcode scanners, and we decided the best plan was to break one on video. Somehow we failed. Aside from some superficial (and some less than superficial) damage, the scanner kept on scanning. 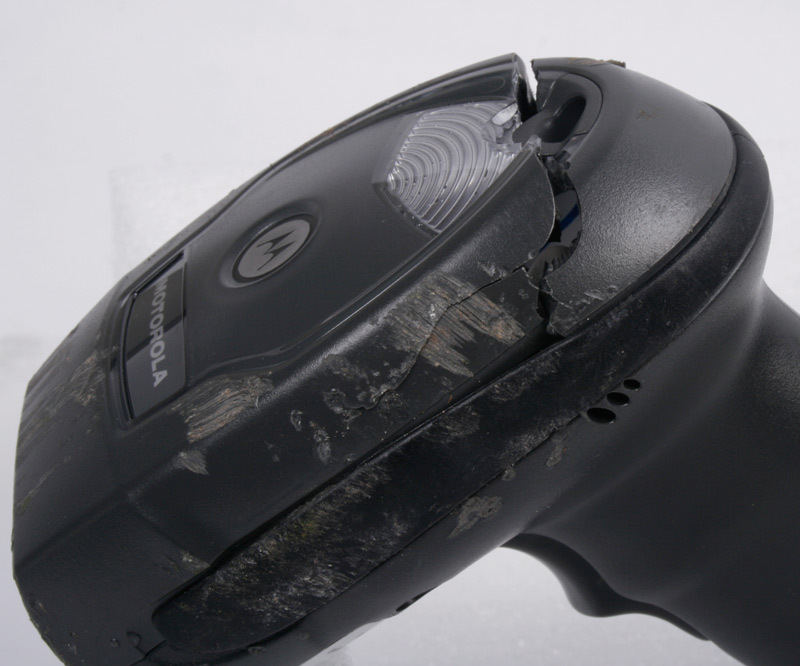 So after dropping it from about 80-feet to asphalt, kicking it down a road, spiking it off a wall, hitting it with a plank, standing on it, hosing it down, and driving over it a few times, we could only scuff up the housing and crack the head of the scanner. But it still runs like a champ. 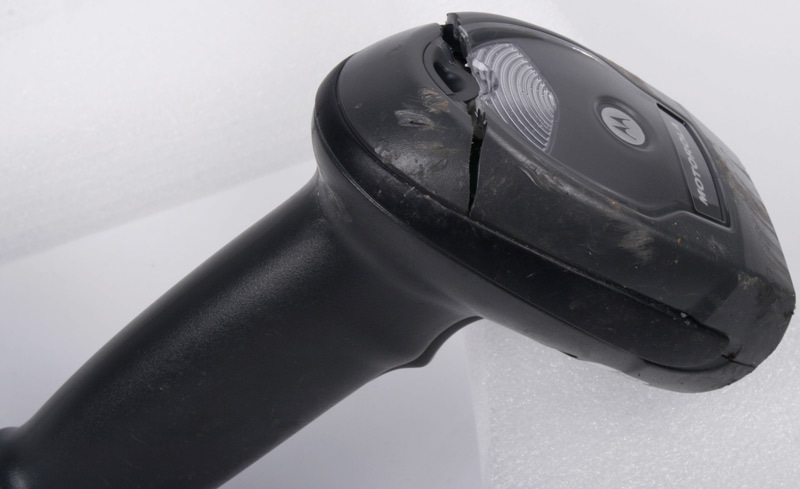 For a retail-priced scanner, we were amazed at the amount of abuse it survived. We really don’t recommend actually doing this to your scanner, but if you have remarkably clumsy employees or like to throw stuff to people, this is a great fit. 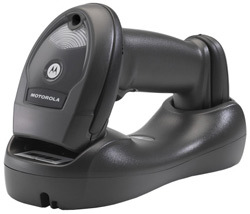 I’ve traditionally pegged Motorola (really Symbol) as the company that makes great laser scanners. Their LS2208 has been selling a ton since the beginning of time, and it’s a great choice for a lot of retailers. However, with their creation of the Blockbuster 2D imager, and now their linear imager, they’re distancing themselves from the pack as a premier data capture manufacturer. Their first entry into the linear imager market, the Motorola LI4278, has a list of specs that make it a fantastic choice for cordless scanning. The LI4278 looks very much like their LS4278, and is a cordless 1D barcode scanner. I do believe it will be supplanting the LS4278 eventually, so the transition should look pretty seamless. And it’s compatible with the LS4278 cradles, so if you have an old LS4278 and you want to upgrade, you just need the scanner. That is great forward thinking on Motorola’s part. There are plenty of LS4278’s in the wild, and if the LI4278’s spec sheet is any indication, upgrading is a no-brainer. In terms of scanning, the LI4278 is a fantastic device. For standard UPC barcodes, you can get a read from an inch to 31 inches out. Most linear imagers out there can get reads from 18 inches back, some of the higher end ones make it to about 25-30 inches, so a retail scanner getting reads from that distance is going to be a boon to many businesses. Especially places like Costco, where maybe you can’t reach the barcode way up on the second or third shelf. High volume scanning should be no sweat for the LI4278. A maximum scan speed of 547 scans per second hangs in with even some presentation scanners, and the barcode scanner’s motion tolerance of 25″ per sec (1.4 mph) is pretty solid for a linear imager. Bluetooth powers the wireless radio on the LI4278, Bluetooth v2.1 Class 2 to be exact. Most manufacturers run with this radio, as it can send data pretty quickly, and data transmissions are encrypted. Why you don’t want prying eyes to know you just scanned a case of Mountain Dew is a little beyond me, but I guess it’s important when you’re scanning like drivers license or customer data. With this radio, you get 330 feet of effective range, way beyond most cordless scanners and their paltry 33 feet of radio range. The Bluetooth radio also allows you to connect the LI4278 to a mobile computer or laptop, maybe even your iPhone or Motorola ET1 tablet. It runs in HID mode, so scanned data will be sent as keyboard input, making it really easy to integrate into a lot of mobility applications. The LI4278’s battery provides more than a shift’s worth of scanning, eliminating nagging fears that the scanner’s just going to stop partway through a day. The replaceable battery with “green sustainability” can run for 72 hours on a full charge, or up to 57,000 scans. I can see why they’d put an either or. At the max scan rate, you can hit 57,000 scans in a little under two minutes. Or if you stayed at that scan rate for 72 hours, you’d read 141.7 million barcodes. Motorola built the LI4278 for retail and maybe light industrial applications, and the durability matches up with those needs pretty well. The scanner sports an IP54 seal, though it’s advertised as a “gasket seal to protect from dust and water sprays.” It’s also built to withstand 100 consecutive 5-foot drops to concrete, so even a really clumsy person should be okay to use it. I’m trying to get one in house to really put it through its paces, but so far the LI4278 is poised to be a fantastic scanner and a great release to start 2012. The 330-foot range and advanced scanning capabilities ensure that it’ll exceed most business’s needs for quite some time. And personally I’d rather have a product that does a lot more than I need, rather than a lot less.